April 23-26 - Long Beach Convention Center | Long Beach, California. 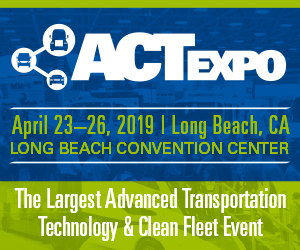 Join us April 23–26 at the Long Beach Convention Center in Southern California for the Advanced Clean Transportation (ACT) Expo, North America’s leading conference and expo showcasing the real-world application of the latest transportation technologies, drive trains, and clean fuels. ACT Expo combines the best educational content in the industry with a cutting-edge trade show floor showcasing the most innovative technologies on the market today. Connected vehicle technologies and fuel efficiency improvement strategies and equipment will be key focal points for the 2019 show, set against the backdrop of increased use of alternative fuels, innovative powertrain solutions and economic & environmental fleet sustainability. Joins us April 24-26 at Northern Carbon World at the InterContinental Los Angeles Downtown in Los Angeles, California. NACW 2019 will explore the progress of climate policy, carbon markets, and climate finance in North America and around the globe. By understanding emerging and dynamic trends and building collaborative relationships with an expansive network of climate professionals, attendees will learn how to successfully meet the challenge of a carbon-constrained economy. Connect with Same Wade from the RNG Coalition at this event. Email Sam Wade HERE. Join us April 30 at Energy Solutions Center Workshop at NW Natural in Portland, Oregon. This 1-day workshop is geared for natural gas utility customer support, energy efficiency, and sales and marketing professionals that work with C&I customers to save energy and reduce carbon footprint. 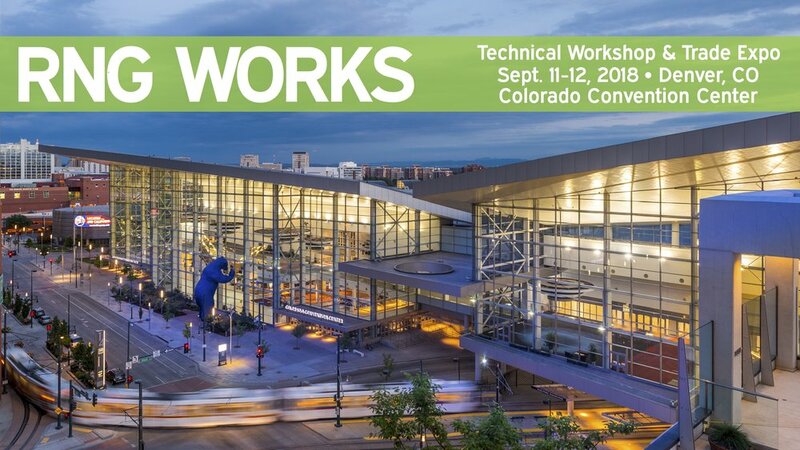 Attendees will gain knowledge, skills, and abilities to effectively deliver energy solutions to end users. Various speakers will discuss solutions to reduce energy use and maximize low carbon strategies, such as ZNE buildings and renewable natural gas. The workshop will address beneficial electrification implications, innovative commercial foodservice equipment, and gas heat pump development. There will be ample opportunity to network and learn from gas industry peers throughout the 1 day workshop. Connect with Marcus Gillette from the RNG Coalition at this event. Email Marcus Gillette HERE. Join us April 30 at The Power of Waste: Renewable Natural Gas for Arizona at Southwest Gas in Pheonix, Arizona. The Power of Waste is a one-day Energy Vision workshop hosted by Southwest Gas — in collaboration with academic, industry, government and NGO partners — on the production and use of Renewable Natural Gas (RNG) made from Arizona's organic waste, with a particular focus on agricultural, municipal and food processing wastes. Join us May 13 at Argus Canadian Clean Fuels and Carbon Markets Summit at Calgary Marriott Downtown Hotel in Calgary, Alberta. Argus Canadian Clean Fuels and Carbon Markets Summit is a one-day information-packed event to get insight you need on Canada’s clean fuels and carbon markets. SAVE THE DATES and join us Tuesday and Wednesday, May 14-15, 2019 for the RNG SUMMIT U.S. Federal Fly-In, Legislative and Regulatory Policy Forum, Capitol Hill Meetings & Mid-Year Members Networking Events. The 2019 RNG SUMMIT will be hosted at the headquarters of new 2018 Leadership Level member Washington Gas (WGL) near the U.S. Capitol in Washington, DC. Registrants will have the opportunity to participate in a Policy Forum, to meet with and educate key Congressional Members and their Staffs on Capitol Hill, and to network with fellow stakeholders. Networking opportunities include an evening reception, orientation breakfast, lunch, and concluding the 2019 RNG Summit on the evening of May 15 in two adjoining suites at Washington Nationals ballpark. Learn more about the annual RNG SUMMIT HERE. Join us June 25-28 at the Air and Waste Management Association in Quebec City, Quebec, Canada. With the theme “Winds of Change – Vents de changement”, ACE 2019 will be an exceptional opportunity for all environmental professionals, industry leaders, researchers, young professionals, students, and stakeholders to exchange ideas and discuss new solutions for with environmental, energy and health issues. Connect with Sandra Franco from the RNG Coalition at this event. Email Sandra Franco HERE. RNG Coalition member utilities Southern California Gas Co. (SoCalGas), Pacific Gas and Electric Company (PG&E), and nonprofit organization Energy Vision, will jointly host the free one-day conference, "The Power of Waste: Renewable Natural Gas (RNG) for California." The event will be held at SoCalGas' Energy Resource Center in Downey, California, on Tuesday, October 2, from 8:30 a.m. to 4:00 p.m. This full-day workshop, the third annual event co-hosted by SoCalGas®, Energy Vision and PG&E, will discuss RNG and its critical role in enabling California to achieve its greenhouse gas reduction and air quality goals.